Since all vinyl replacement windows are fundamentally similar, the windows companies go to great lengths to differentiate themselves from the competition. Sometimes this results in useful innovations. Other times, it's downright silly. Yes, it's true. One of the companies we considered had an option for self-cleaning glass. This had me picturing little men with squeegees that pop out of a compartment at the top of the window. Turns out it's a special coating that supposedly causes water to bead up and roll off the window without leaving residue. I can't tell you if it works because I thought it was too funny to take seriously and not worth the extra money they wanted for this option. Muntin grids add a decorative touch to vinyl replacement windows. 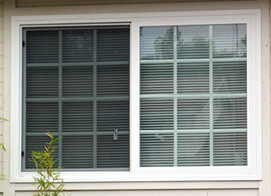 Almost all dual paned vinyl windows can be ordered with a grid between the two panes of glass. The technical term for these grids is muntins. They are a series of thin bars that simulate the look of a real old-fashioned wood window made up of several panes of glass. The grids serve no functional purpose and are simply cosmetic. Many people think they look classy, others find them tacky, but they're clearly popular as you can see by driving around most neighborhoods. If you like the look, go for it. It will add a modest amount to the cost of your replacement windows. Another, newer design option is beveled glass. With this style of window, a real beveled design is etched into the glass. Most commonly, it is a rectangular border spaced a few inches from the edge of the glass. Bevels generally look nicer than grids since they are "real" instead of simulated, but they are also more expensive. Dual paned windows (which means there are two sheets of glass) are standard in the vinyl replacement window business. You probably won't encounter a company that doesn't offer them. They provide great advantages in energy savings and noise reduction. Vinyl replacement window companies make a big deal about what goes between those two sheets of glass. Many will tell you that they fill the space with special gasses (usually argon or krypton) that provide tremendous benefits in energy savings and/or noise reductions. Others will tell you that the gas leaks out over time so you're just as well off having air in there. It seems the benefits of the gas are greater in colder climates and not as important in areas like Southern California. In any event, you have no way of verifying if the promised gas is really in there or if it will leak out a week after your windows are installed, so this doesn't seem like a critical consideration to me. The vinyl window salespeople also put a lot of emphasis on the seal that's used to connect the two panes of glass. This seal is very important, because you don't want air to leak into the space between the glass. If that happens, you can get condensation on the inside of the window that's next to impossible to remove. The window companies all claim to have developed the world's best high tech seal that's guaranteed not to fail. They'll show you diagrams and photos and samples of the materials. Problem is, unless you're some sort of engineer you have no way of knowing if any particular seal is really better or worse than any other. My advice is to take the mumbo jumbo about the seal with a grain of salt and get an iron clad warranty that covers condensation between the panes. Accept nothing less than a warranty that offers lifetime replacement if this type of condensation occurs. The width of your vinyl window's frame is another key factor to keep in mind. With all vinyl replacement windows, you are going to loose some of your glass area. It's unavoidable since the new vinyl frame fits on top of your old aluminum or wood frame. Less glass area means less light will enter the window. In rooms with small windows, this loss of glass area can be very noticeable and the room could become unpleasantly dark. The best way to minimize this loss of glass it to get the thinnest vinyl frame you can find. The current trend is to switch to thinner frames, but there's still a lot of variation out there so make sure to compare. If you want to be able to clean your new windows without going outside or getting on a ladder, there are some easy cleaning features that will help. Most sliding windows can be lifted out of their tracks for cleaning. Some single and double hung windows are designed to tilt inwards so they can be cleaned. For sliders, some companies offer tracks that pop out so you can rinse of the dirt and other junk that always builds up there. Vent locks secure the window while it's partially open. 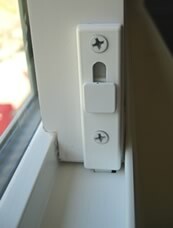 Vent locks are built in devices that allow you to keep a window locked while it is open a few inches. They can be a great way to have some security while keeping a window open for ventilation. Vent locks come in many different variations. Some are spring-loaded plastic wedges that pop out of the frame to stop the window from opening beyond a predetermined distance. Another type is a bolt that attaches to the moving part of the window and slides into a hole in the frame. One company that didn't offer vent locks said they'd make us some vinyl sticks to place in the frame, which we thought was a rather cheesy solution. Keep in mind, these vent locks don't provide a high degree of security and with an open window, you may not be able to set your home security system. Since vinyl isn't as strong as materials like aluminum they can be broken with a rather small amount of force. Many vinyl replacement widows tout the security features of their products, but this is one area where vinyl falls short compared to other materials. It's simply not as strong as aluminum, for example. For added security, look for windows that include well made locking mechanisms. Some companies will even place more than one lock on windows over a certain size. Windows that include the vent locks mentioned earlier also offer a higher degree of security. One big security advantage of vinyl replacement windows is the glass itself. Most likely, you'll be trading in single paned widows with thin glass for double paned windows with thicker glass. That means your new windows will be a lot harder for a burglar to break. If security is a top priority, look for "security glass" which is even harder to break through.